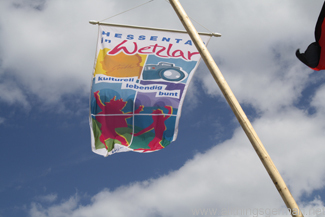 Having spent ten days last year writing about the Hessentag in Oberursel, my curiosity got the better of me and I decided to visit the event this year in Wetzlar. Although I did not set out to do a direct comparison with last year, the headline in the Oberurseler Woche claiming “Oberursel war schöner” (Oberursel was nicer) intrigued me as well. And so it was that I set off on Friday morning to drive to Wetzlar, which is about 45 minutes by motorway from Oberursel. I followed the signs from the motorway exit to the car park, and my heart sunk when I saw which one the route had taken me to: P12. The furthest car park away from the Hessentag area! Luckily there was a shuttle bus to take me into town. Unluckily it did not actually leave from the car park, so my Hessentag experience started with a short walk through a field alongside a river, to where the bus was waiting. It must say something about the distances involved that there were even toilets laid on for people waiting for the bus at this point. 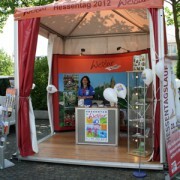 Of course, it would have been nice if the bus had then actually taken me to the Hessentag area in the town centre. Instead it went to the station. And the wrong side of the station at that. So having left the bus I first walked up a flight of steps to a road bridge, in order to cross the tracks and then go down the steps on the other side and finally start walking towards the town centre. Originally I had wanted to start my walk around from the Landesausstellung – the exhibition which is a bit like a county show, but that was at the other end of the town, so I decided to just work my way around everything. Now in Oberursel the so-called Hessentagsstraße – the “street” that crossed the town with lots of stalls in it – was mainly just a few long streets. They were packed with people in the daytime, and most importantly they were closed to traffic. Wetzlar seems to have gone a different way here and put the Hessentagsstraße all around the town, in some places without any stalls on it at all, and not closed it all off to traffic. There were barriers separating the pedestrian area from the road, but it made it narrower that way. I also felt that there were a lot more food and drink stands than last year, whilst less arts and crafts. These had an area to themselves, but were not – in my opinion – going to get so much passing trade that way. And whilst Oberursel was literally plastered with signs and maps on how to get around, these seemed scarce at times, so that I sometimes found myself looking for them. Strangely some things looked just the same as last year. 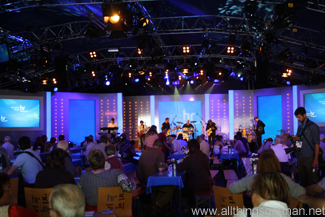 The Hessischer Rundfunk tent probably was the same tent, with the addition of backstages tours on offer. At least, I do not remember seeing them on offer last year. There was not much to see backstage though, as the main Outside Broadcast Unit had already left and taken much of the equipment with it, so it was a case of “if you had come earlier in the week, then at this point you would have seen…”. The main hall in the Landesausstellung – Nr. 1 – was very familiar. The stands were arranged in the same way as last year, and with the exception of the host stand which obviously had Wetzlar merchandise instead of Oberursel even most of the flyers on the stands were the same. I got the feeling that things were more spaced out and that I was walking more between the main areas of the festival. 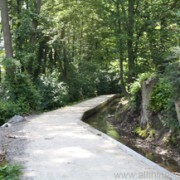 This was in part due to the River Lahn running down the middle of the Hessentag area and making getting from one point to another often a case of deciding which bridge to cross. What fascinated me last year in particular were the amount of things taking place on smaller stages throughout the week, not just the big concerts. Maybe I was in Wetzlar on the wrong day, but by the time the smaller stages got going it appeared to me to be just bands playing on them. Where were the school choirs, the debates, and the simple musicians who perform without the need for a sound check? The day ended almost as it had begun with a trek back to the bus stop, only to find the sign for my shuttle bus had been crossed out. The bus was waiting there anyway, and so I made it back to the field where I had left my car earlier in the day. I felt that Oberursel had offered me more. 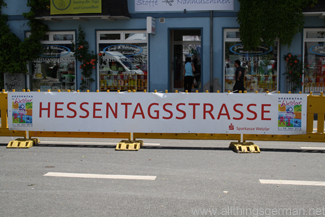 I also understood why the Mayor of Oberursel had said that our Hessentag was going to be “one of short distances”. I now appreciated that statement a lot more. 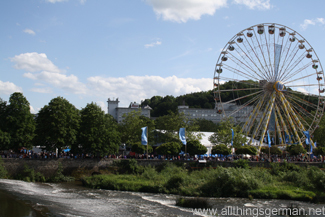 But one other thing remains to be said about my experience with the Hessentag, in particular as a blogger. 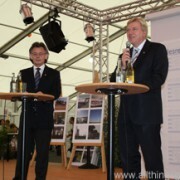 Last year I had been denied press accreditation as a blogger, and had even brought up the subject of both this about my calls and e-mails to the State Chancellery going unanswered with the Ministerpräsident (prime minister) of Hessen, Volker Bouffier, who had replied with the phrase “Come to Wetzlar. In a years time it will be different”. Government Spokesman Michael Bußer had even promised to as to why my calls and e-mails had not been returned. Indeed, this year things were different. The press accreditation was toughened up so much, that even a press card was not sufficient to enter some areas. I didn’t even try! The social media was better though. I even got a timely response from the Hessentag Facebook team. Which is more than can be said for Volker Bouffier and Michael Bußer. A year has gone by and I never heard from either of them again – a point that I would have made at this year’s Bürgersprechstunde if I had been able to go on that day. Instead I submitted the a question on-line as to why I had not received a response to my question from last year. I am told by the Facebook team that the question was passed on. I’ll be sure to write about it if I ever get an answer!